Promoting gender equality and empowering women is one of the United Nations Millenium Development Goals. The aim of the IYA2009 cornerstone project, 'She is an Astronomer', is to provide information to female professional and amateur astronomers, students, and those interested in the gender equality problem in science and provide a focal point and forum for women in astronomy. 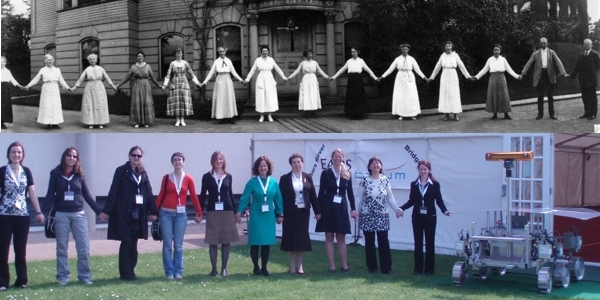 Women in astronomy at Harvard circa 1917 and at the European Week of Space and Astronomy 2009 (with Bridget, the ExoMars rover prototype). Approximately one quarter of all professional astronomers are women. In some countries there are no female astronomers, whilst in others more than half the professional astronomers are female. The drop in numbers towards more senior levels suggests that scientific careers are heavily affected by social and cultural factors, and are not determined solely by ability. This loss, not least in terms of the financial investment in training and then losing women at higher levels, means that it is in the interest of all societies to ensure that these factors are addressed. As part of the ongoing plans, 'She is an Astronomer' is looking to collect and disseminate statistics and information that can be used as quantitative, factual data to back up discussions on gender equality in astronomy. Through a series of meetings and workshops, 'She is an Astronomer' also aims to raise some of the issues that are of common concern to women working in the field and present solutions to tackle them, identifying and sharing Best Practice techniques. Throughout IYA2009, we will be holding monthly polls on our front page about some of the key issues facing women in astronomy and set up a forum to discuss the wider implications. As IYA2009 progresses the website will grow: profiles of current and historical women astronomers will be added and we will be expanding the resources section. At the end of the year, the information gathered will be retained and maintained as a legacy from IYA2009.